A horse-drawn wagon with a new pioneer family caused quite a stir in 1877. The surprise was not the family itself, but that the cart was drawn by horses not oxen. The distinction would serve the city well in upcoming years as Elijah Boley and his son Alphonso would be instrumental in the development of horse racing in the area, and the Missouri Slope Fair and Mandan's rodeo. Elijah was born on March 31, 1826 to a Pennsylvania farm couple John and Mary Boley. He and his parents followed his sister Mary and brother-in-law John Beard to Mahoning County, Ohio in the late 1840s where Elijah worked on the Beard farm as a farm laborer. He met his future spouse Sarah Lewallen and the two were married on December 31, 1853 in Indiana. Sarah and Elijah were engaged in farming, milling and stock buying in Bourbon Township Indiana until 1863, when they moved to Monona, Clayton County, Iowa. While in Iowa, they would operate a farm as well as a small hardware business. The couple had four children although only two would live to adulthood: son Alphonso born on June 5, 1857; son Adolphus in October 1859 who died as a child; daughter Alvaretta born about 1860 but also died as a child; daughter Viola Mae who was born on April 20, 1863. All four children were born to the couple when they resided in Indiana. In 1877, he and his son Alphonso staked out a claim on the present site of the Montana-Dakota Heskett Power Station north of the city. Their claim is said to be the fourth such claim on the west side of the Missouri River. The US Government was operating river port for steamships known as "Bellows Landing" later to be renamed as "Rock Haven" but the senior Boley envisioned the location for the Northern Pacific railway bridge crossing and by necessity where a city would spring up. This dream, however, exploded when the survey placed the bridge further south. The family would be reunited in early 1878 when wife Sarah and daughter Viola would travel via train to Mandan in early 1878. Their holdings would grow to 990 acres. Elijah Boley figured prominently in county and city affairs until his death. He was appointed the first county assessor in March 1878. Boley assisted in the organization of the county election precincts and commission’s districts, served as election judge in precinct No. 1 and volunteered his home as a polling place for the November 1878 county elections. He was elected as one of three first Morton County Commissioners in that election. He was also instrumental in securing Mandan as the location of the Reform School (now the ND Youth Correctional Center.) In 1895 he deeded 40 acres of land for a site for this institution and with an additional 160 acres to be purchased from him at $10 per acre. However, the deed was later cancelled when frictions arose. The facility was eventually approved by the state legislature in 1902 and was opened to students in 1903 on its present location. The 1879 Dakota Territorial legislature attached the eastern portion of Morton County to Burleigh County. A group of 26 citizens led by Elijah Boley and Frederic Gerard petitioned the US Congress to restore the original Morton County boundaries which was ultimately accomplished by the 1881 Dakota Territory legislature. Boley was appointed one of three county commissioners by Governor Ordway who met on February 25, 1881 to organize Morton County. He was elected the chairman of the county commission. In 1885, the Morton County Commissioners decided the former saloon and keno hall but existing courthouse should be replaced. 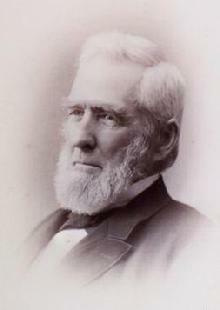 Elijah Boley, then county commission president, championed the Collins Avenue hillside location. He proclaimed, " In ten years Mandan will be as large as Chicago and the hill north of the city will be the center of population." The Commission purchased the property from the City of Mandan. The Collins Avenue Courthouse opened the following year but was destroyed by fire in May 1941. Elijah Boley is also credited with conducting seed development using Arickara/Ree corn starting in about 1880. Unlike the Indians and other area farmers, Boley reserved the best kernels for seed and sold the remainder corn. His corn eventually developed 12 rows per ear rather than the more typical 4 to 6 rows. He also claimed that "the Ree corn matures rapidly, and because of its hardy nature it is not liable to fail if planted early enough." Elijah and his wife Sarah remained in the Mandan area for the remainder of his life. Boley died March 2, 1901 and is buried beside his wife Sarah in Union Cemetery, Mandan. The Society would like to thank Joel Winckler and Cheri (Boley) Zuber for the additions and corrections to biography.